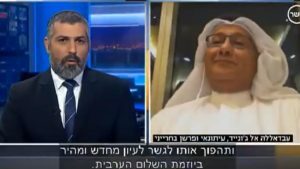 A Bahraini journalist has appeared on an Israeli TV channel to lambast Iran in a move which confirms the tiny Gulf monarchy’s tilt towards Israel. Though there are no official ties between the Gulf kingdom and the Jewish state, recent statements and moves by Bahraini officials herald diplomatic detente between the two countries. UAE-based Sky News Arabia and Saudi Makkah newspaper writer Abdullah al-Junaid in one-off occasion appeared Wednesday on Israel’s Channel 10 in a video call interview on Iran’s alleged threat to the Gulf and Israel. “Sir, we communicate with the whole world and that pleases us,” Junaid first said. “Iran poses a direct threat to Israel’s national security, as well as to ours,” he added. Junaid also addressed ties between the two countries noting that dozens on Jewish live in Bahrain. “We have Jewish citizens living in Bahrain,” he said. Before Junaid’s unprecedented move, the Bahraini monarch Hamad bin Isa Al Khalifa according to reports last month called for an end to Israel’s isolation by most Arab countries in favor of official diplomatic ties. According to the Bahraini monarch country’s citizens are free to visit Israel. The Gulf country last year hosted a delegation of US Jews at a ceremony to mark the Jewish Hanukkah holiday – an event attended by several citizens in local attire. Israel has admitted that its ties with some Arab countries have unprecedentedly improved with a lot of stress put on security cooperation in the fight against terrorism and Iran’s growing influence. Also on Sunday, Saudi Arabia denied reports that a high profile member of royal court had made a clandestine visit to Israel to meet Israel officials. Some reports identified the royal as Crown Prince Mohamed bin Salman.